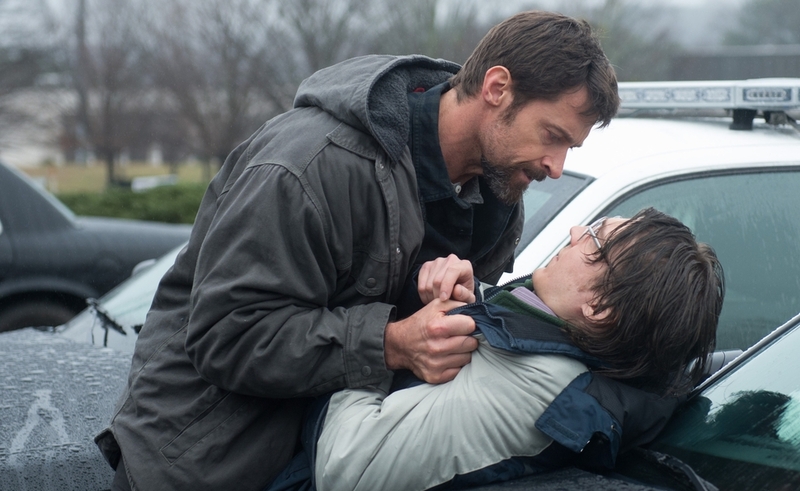 In director Denis Villeneuve’s mystery-thriller Prisoners, Hugh Jackman plays Pennsylvania carpenter Keller Dover, a man who keeps enough emergency supplies in his basement to survive nearly any disaster, because the one thing he learned from his father is that a man should be prepared. But then one Thanksgiving, while Keller and his family are having dinner with his best friend Franklin Birch (Terence Howard) and his family, the youngest daughters of both clans disappear. Keller responds by abducting the man he’s certain is responsible—an uncommunicative local freak named Alex Jones (Paul Dano)—and using his store of resources to torture out a confession. But Keller lacks the right equipment to exact justice. The point of Prisoners is that there are some crises no one can plan for. Having a child abducted, and not knowing what’s become of him or her, is a devastating event that can redefine a person. Prisoners is a heavy movie exploring serious themes, similar to the contemporary prestige procedurals Zodiac and Mystic River. But this isn’t always the best direction to go with this material, which in essence is more like a page-turning paperback than a rich drama. Unlike Zodiac, this isn’t a mystery with a lot of red herrings and cold trails, where the real “mystery” is existential. Prisoners’ real protagonist isn’t Keller, but rather the brilliant, thorny local cop Detective Loki (Jake Gyllenhaal), who chases every lead, as Villeneuve and screenwriter Aaron Guzikowski carefully build a case for two hours so that they can spend the last 20 minutes spilling answers all over the place. At every step, Prisoners is open about what it means to say. The film follows Keller into the dark, to show how a victim can become a victimizer, and thus perpetuate a vicious cycle of evil. It’s all quite blunt. Jackman’s not at his best in Prisoners, playing a brooding, joyless character out of step with the kind of graceful macho that’s more his forte. Gyllenhaal, on the other hand, makes a terrific Loki. His wildly overqualified small-town police detective is by turns righteously angry and sardonically funny, and Gyllenhaal gives the kind of unflashy performance that rarely wins awards, even though it actually anchors this film, giving the audience someone to want to watch. Gyllenhaal delivers pro-forma cop-speak just right—a lot of “Sir, I hear what you’re saying, but you need to calm down,” delivered in a neutral murmur—but he also carries the particulars of this case deep within his sunken eyes, playing Loki as a man who knows that every bad hunch he has wastes time that could cost the Dovers and Birches their little girls. And while Prisoners is light on the kind of big, memorable setpieces that distinguish a movie like this—aside from one knockout scene featuring mysterious boxes and surprising snakes—the film looks so stunning that its bigger lapses are more forgivable. Villeneuve and cinematographer Roger Deakins bring this cold, wet Pennsylvania community to life, defining the space it holds between vast expanses of shadowy forest (perfect for hiding a body) and a big highway that could whisk a criminal away before anyone even knew a crime had been committed. What makes Prisoners more potent than its oft-implausible mystery should allow is the way Villeneuve lingers over the textures of a terrible event. He holds on the moment when rain turns to snow, and the vertiginous blackness of a basement grave. And he shows how something as innocuous as a pink toothbrush can take on a new meaning after the person who used it is gone.